Often times we forget how legends come to be. Since 1982, Fisher has been creating the legend of Teddi, but as the years go on, some of the story tends to get lost. Here are some of the missing pieces that you might not know. Elizabeth “Teddi” Mervis was diagnosed with a brain tumor in 1979. As with any child suffering from terminal illness, Teddi experienced many adult feelings at such an early age. Her father, Gary, wanted to do something to ease some of the pain in Teddi’s life and to bring some of her childhood back again. Within a year of Teddi’s diagnosis, Camp Good Days and Special Times was born. Here children with cancer could come and be kids a gain. They realized that they were not the only ones in the world fighting this terrible disease. At camp, they can fish, hike, swim, canoe, build campfires, and play without being surrounded by sadness, and reminds them that they can do everything other children can do. Here, the children could laugh. 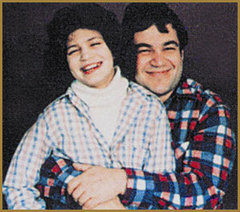 Teddi enjoyed the happiness of Camp Good Days until her death in February of 1982. Since then, Camp Good Days and Special Times Inc., has grown internationally. With over 17 programs, they help children, not only with cancer, but those with AIDS, sickle cell anemia, burn victims, and even brothers and sisters of sick and disabled children. One of these programs is the Teddi Project, which helps to fulfill the special wishes of terminally ill children. Dr. Lou Buttino, a former professor as St. John Fisher College and close friend of Gary Merivs, thought that his students might be able to help. After talking with a small group of students, a 24-hour dance marathon was suggested. The Dance for Love began in 1982 with only a few dozen dancers. That year they raised approximately $7500. Since then the dance has multiplied in size with over 400 dancers and volunteers raising an average of $50,000 each year. The Dance for Love is the largest fund-raiser for the Teddi Project, and the largest activity on the Fisher campus. It is the students at Fisher who make these wishes come true for so many sick children. We make it possible for them to shake hands with Mickey Mouse or visit a distant grandparent. So in the wee hours of the morning, when your feet are sore and your body is tired, look for the pink balloon floating somewhere by itself. It is said that the pink balloon is Teddi’s spirit still alive as we DANCE FOR LOVE.